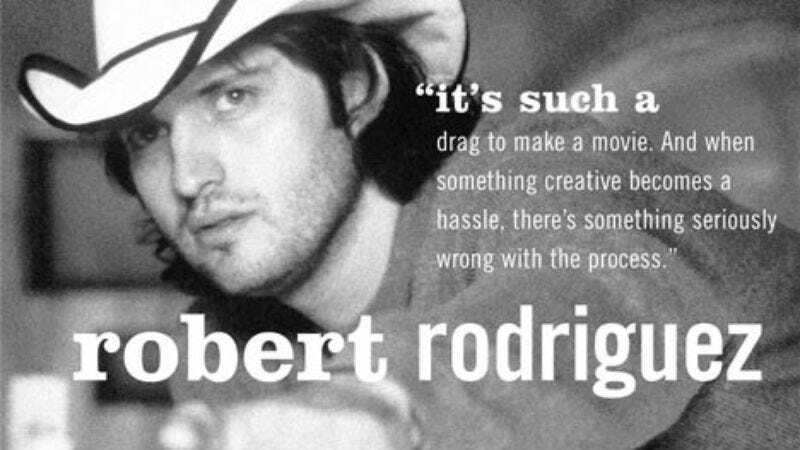 Texas native Robert Rodriguez shot to fame in the early '90s as the man who made a movie for $7,000. Intended as a practice film for the Spanish-language direct-to-video market, El Mariachi became an art-house hit. Though crudely made, it displayed a breathless joy that continued through each of Rodriguez's subsequent films. After making the B-movie homage Roadracers for cable, he returned to the big screen with the El Mariachi remake/sequel Desperado, starring Antonio Banderas and Salma Hayek, who became regulars in Rodriguez's films. After contributing a segment to the little-loved indie anthology Four Rooms, Rodriguez collaborated with Quentin Tarantino on the vampire movie From Dusk Till Dawn, then directed The Faculty, a Kevin Williamson-scripted high-school variation on Invasion Of The Body Snatchers. Last year, Rodriguez scored his biggest hit to date with Spy Kids. This fact that Spy Kids 2 is following only a year later is largely attributable to Rodriguez's unique approach to filmmaking, which, for him, is even more of a one-man show now than it was in his Mariachi days. Operating largely out of a home that also serves as a soundstage and editing bay, Rodriguez not only wrote, directed, and produced Spy Kids 2, but edited it, composed the music, supervised the visual effects, shot it, and served as the production designer. Ask him how he does it, and he modestly defers the credit to common sense and tools like digital editing and high-definition video, which he speaks about with the fervency of a convert. If anything, he recently told The Onion A.V. Club, he's puzzled as to why other filmmakers don't do it all. Robert Rodriguez: I'm a parent, so yeah. I grew up with those really cool family movies. That was one of the main reasons I wanted to do a family movie, was to get that back. I'm from a family with 10 kids, so my parents would haul us to the theater and sit there and watch the film at least twice, so we appreciate a good movie. And I wanted to bring that back, because back when I wrote [Spy Kids], back in '94, family movies were pretty much dead for a while. When they were made, they were made only because "Kids always need something to watch, we'll turn a quick buck. It'll make us $10 million, we'll get a TV director." So we had this dearth of really cool family films. I think if someone takes it seriously and really goes in and does an all balls-out action-adventure movie that's about family at its core, but that has all these other things to entice people to come see it… My biggest worry was, "I want to make a movie about my family, but how do I do it without boring everyone to tears?" And I thought of the angle of making them spies, and the parallels you can make with the mission of keeping the family together to a spy mission, that'd be a way to make something really organic and cool. O: You became famous as the guy who made a $7,000 movie. Spy Kids 2 looks like it cost $100 million, but is it safe to assume that your old budgetary philosophy carries over through your current work? RR: All the way through. When I saw what my value could be to the system… I realized, "Wow, no one ever would have made Mariachi; I just made it and they put it out." So if you keep that freedom, you can just make whatever you want, and they'll put it out. So how do you do that? It was all very clear, it was all about money: Just don't spend very much money. And, coming from a family of 10 kids, we always prided ourselves on being able to do things for less, because we had to. We had that survival instinct; everything had to be done for two bucks. So anyway, I can make a big-looking movie for very little money by just being resourceful, being creative, using the rubber band versus a lot of technology, and not being ashamed about it. I took a lot of pride in that, and really thought that was a more creative way to go. It's just real easy to have a money hose there; as soon as another challenge or problem comes up, you just aim it and wash it away. That's a job, is to take on those challenges creatively, because that's going to make the movie better, because it's a creative endeavor. So I really stack it against itself, and I make my own budgets. And they're always willing to give me more. [They say] "Are you sure you can make it for that much?" And I go, "Probably not, but I'll do it that way, because I'll be forced to be more creative than I'm even intending to." The problems I solve creatively are going to make it so much cooler, and you have to challenge yourself that way. Otherwise, you'll never rise above where you are. So for this movie, the first one did really well, and Harvey Weinstein said, "You gotta spend $60 million next time." The first one was $36 million. And I knew what he meant: "Make it bigger, because audiences are going to be there now in droves. Don't try to be the hero. Make it bigger, better." Which I intend to do. But give me the same budget, and that'll happen. The only chance a sequel has of being better than the first one is if you take the money away. Instead of thinking, "How am I going to spend $120 million today?" you think, "How am I going to make this movie any good?" All your energy goes into something else. O: You also taught yourself CGI, is that correct? RR: Yeah, that's what From Dusk Till Dawn and The Faculty were for. I was already writing Spy Kids, and I knew that would be my bigger movie, because it wasn't for the niche audience, it was for a broader audience, it had the potential to just be something more special. But I didn't know enough about the effects, and I didn't want to have to call in the technicians. So I did some practice movies to prepare myself to do Spy Kids the way I did Mariachi, where you're able to do everything yourself. Because that's just so important. Then, you're a painter. Then, you can just paint on the canvas; you don't have to have the paint mixer there, and the canvas stretcher there, and the paintbrush holder there. As soon as you put the obstacle course in front of you, where you barely get something on the canvas—that's why with so many movies, you say, "You mean they had that much money, and that much time, and that many people, and that many resources, and that's the result? That thing? That's it? That's all they got?" Because the process is so complicated, the end result ends up being very simple. Whereas if you reverse it, if you simplify the process, then what's going to end up on the canvas is something much more complicated. Many more layers, many more colors. Because you're free to just keep putting layers on. O: What's the single area where money gets wasted the most? RR: It's just across the board. I can only explain it in terms that you can just multiply. I'm the production designer. And the DP. So, [in Spy Kids 2], there's a big underground lair in a volcano, and when Steve Buscemi walks out, behind him, there are all these stalactite-type rocks. There's only three rocks, and they're on wheels. So whenever he's standing looking at the volcano, I roll those rocks behind him and light them. And then when I shoot over this way, I roll 'em over there; if you look close, it's the same three rocks, just lit differently. Now, no production designer would ever allow the director to show up in the lair and see three rocks. He would have wanted 50 rocks. But knowing what I can do, it'll look like 50 rocks in the end. O: You save salaries that way too, by doing it all yourself. RR: I think the process has just gotten out of control. When movies started, —go back to the Buster Keaton age, when they were still making great movies—there were five people behind the cameras. It's just gotten out of control to where it's become unwieldy, and the process has gotten so complicated. That's why you see a filmmaker make one movie every three or four years—because it's such a hassle. It's such a drag to make a movie. And when something creative becomes a hassle, there's something seriously wrong with the process. George Lucas told me, "Because you live outside of Hollywood, you're going to come up with ways to do things and ideas that they don't think of there." When you go off in the world and make your life, and you come back to your home town, and you find your old high-school friends driving in the same circles, doing the same things, that's what Hollywood's like. It's a little block, little town. It doesn't really grow or change. And when you're outside, you look and you say, "This doesn't work at all. Who thought of this system?" And then once you abandon needing film, you question everything. You question the whole process, like "Why are we doing this like that? Couldn't we do the whole sound mix in my garage?" And we did. We did the whole sound mix of the movie in my garage, we mixed it all there. I edited it in my garage, shot at home, made it much more a home movie, which I wanted to do intentionally, because I wanted the movie to feel more animated, it being a family film. It has a strike against it because it has a "2" on it. The only way to make it feel not like product, not like it's just fallen off a franchise line, is by making it a movie, making it even more personal than the first one. And by doing all that work, keeping the budget low, you're forced to put everything in your person into it. O: Does your approach to films make it hard to watch a movie without dissecting where they spent the money, or where they went wrong? Do you find yourself prejudiced against big-budget movies? RR: No, I try to enjoy a movie no matter what, and they should be applauded. The process is so complicated, it's so much of a hassle, it's so anti-creativity, that if a movie is good at all, it's a miracle. It's a miracle if a movie is even watchable. Everyone applauds each other's success in Hollywood because they know how tough it is, but it really comes down fundamentally to the process. O: You've turned down some big movies because you didn't originate them, they're not your project. Is that your policy down the line now? RR: No, I would have done a Spider-Man—I even said, "If y'all ever need somebody to do a Spider-Man movie…" I think that's one that I would like to do, because potentially it's such a cool film. But I was really a big Spider-Man fan; I was really happy that Sam [Raimi] did it. I just know how it is, a lot of times they'll just give it to a director who wants a big gig, but who has no interest in who Spider-Man is at all. But that wasn't the case with Sam, so that turned out terrific. But most of the time, yeah, I turn down other movies only because it's such a machine-type movie. It's gonna be big no matter what, whether I'm there or not. They're going to promote it big, it'll make a lot of money. Whether it's good or not, it'll make a lot of money. It's not like they gave me this big golden script that was perfect; they just have a big franchise character or a movie idea, and they have a script that's in really rough form, and they need to get a director on it before they can really refine it, so they hand it around to everybody, and I just handed it on. It's gonna be so much work just to make it a good movie; I'd rather get into something original, rather than sit there and try to fix something that I won't know how to control. I guess all the people I've modeled myself after, it seems like that's the way to go—you know, George Lucas, James Cameron, guys who own and control their own work. If you're going to put that much work into something, make it yours. You don't have all the fans out there saying, "No, his costume shouldn't look like that," you can just be free. And creatively, you want to be free; you want to be as free as a child. I'm doing these movies because it really helps me go back to when I was a kid, and it just frees me in my creative thinking. I always question, "Will the studio like this? Will the audience like this?" And kids don't think like that. They just do it, and it's beautiful and creative and spontaneous. O: Do your own kids give you input on these films? RR: We're doing a third Spy Kids. The first one, they had no idea what I was doing; I just showed it to them at the première, and then I pulled out the real gadgets and said, "Guess what? I made that movie!" And they're like, "Wow!" They were very young. In the second one, they got to be a part of it in a different way; they were stunt kids in it. I told my stunt coordinator, who's really a careful guy—he has kids, and his kids are stunt kids—"The only way we're gonna make sure no kids get hurt is if our kids are doing the stunts." [Laughs.] So that's what we did. But this third one, they're very creative, they love to draw, so they're going to help me design stuff. And they get so into it. Mainly, even if I don't get any ideas out of their drawings, I just see how creative and free they are, and really model myself after them so I can do the movie in sort of character, like a child would do. O: Are your small budgets the reason you get so much creative control? You've had a long and generally good relationship with a studio that's not necessarily known for its hands-off approach to films. RR: I was just lucky. Quentin [Tarantino] and I got there when they were first starting, so they gave us deals that gave us rights to everything—final cut, trailers, posters—nothing can go out without me being able to make my own. So it's just ridiculous freedoms you have, and I just got used to that freedom, and have done good by it. They don't mind; they like the fact that they can just show up, see the rough cut, and go, "That's it." They also know I've become Mr. Can-Do Guy, and if something's not working out, I just go do it myself. Since it's something I wrote, it's very easy for me to know what to do. Because it's so subjective. If it was something I was just directing, it'd be more difficult, because then everyone's opinion is valid. But because I'm the creator, I can say, "No, no, that can't be like that, because this goes back to when my brother did that to me when I was eight years old." That's why I love doing stuff that I wrote, because you're just 20 steps ahead of everybody, because it goes back so far into your life that they just trust you and follow you. O: Your next movie seems like your most direct Sergio Leone homage yet. RR: Yeah, it's funny, because it was actually Quentin's idea. He walked on the set of Desperado to do his part… And Desperado, all that was, was a way for me to show the studio what I could do beyond Mariachi, because I kept saying, "Why are you releasing that? I did that just by myself! It's not even a real movie! Give me a low budget, and I can make a movie that looks 10 times more expensive!" And so I said, "Let's just do another Mariachi," not thinking about a whole series, and Quentin walks onto the set and goes, "This is your Dollars tribute! Now you have to make part three!" "What are you talking about?" "Sergio Leone, dude. Mariachi is your A Fistful Of Dollars; this'll be your For A Few Dollars More, now you gotta do The Good, The Bad, And The Ugly. It's gotta be epic. And you gotta call it Once Upon A Time In Mexico." [Laughs.] And I was like, "What? Yeah, whatever." And sure enough, a few years later the studio kept calling, saying, "You gotta do another Desperado. It's really caught on." On, you know, cable. O: It didn't do that well when it first came out, did it? RR: No. People sense that it was just a movie way ahead of its time, and if people had kept making those kinds of Latin genre movies, it would be huge business today. But no one ever followed up on that; it just kind of came out, and more people caught on to it later. So I told the studio, "Okay, I'll make one, but it's gotta be epic. And it's gotta be called Once Upon A Time in Mexico. And they said, "Sure." I never thought I'd make the movie. I just thought it was such a hassle to shoot on film, and to go down there again and make a movie in Mexico on film; I just thought, you know, "Life's too short." Then when those HD cameras came around, suddenly all those projects I thought were just impossible felt suddenly doable. Actors' strike was coming up—Yeah, I could write this script in five days, prep in two, we'll shoot in seven weeks!—and that's what we did. It's done now. The studio couldn't believe it; all their movies are over $100 million and still shooting, and they're like, "Man, how'd you do that?" HD, and the system, the process being simplified. It was a 10-year anniversary from when I did Mariachi, so I thought, you know, production designer, DP, I'm going to do all that stuff again. But we had a huge cast—Johnny Depp, and Willem Dafoe, Antonio, Salma, Eva Mendes, Rubén Blades, Mickey Rourke—we had a huge cast for this giant home movie. It looks like a Sergio Leone; it's on widescreen; it looks like we were down there a year shooting. It looks huge! The studio can't believe it. It's this big epic movie about Mexico. O: Do you buy any of the complaints against HD? RR: It's all propaganda. Oh, yeah, absolutely, it's just no contest. It's just so funny to me, because I've seen it all before. Lucas is always way ahead of these people. He tried to show Hollywood electronic editing back in the '80s with Return of the Jedi, and [they said] "What the hell is that? No one's ever gonna cut on computers; they'll always cut on film." And 10 years later, I'm editing electronically, and no one in the business is editing electronically. All the editors are afraid of computers, they're afraid their jobs are going to be taken away. A couple of years later, everyone's cutting on an Avid. You put a gun to an editor's head today, he won't edit on film. Because it's just not any good. You can't realize the best movie that way. And Avids aren't cheap. People will probably move to HD because it's cheaper. Who edits on an Avid because it's cheaper? You're adding hundreds of thousands of dollars of cost to a budget that didn't exist before, because it's a better process. Creative people are notoriously the slowest to adopt new technology. Because it's polar opposites. My first boss taught me, "If you want to be successful, you're already creative. Become technical. Creative people aren't technical; technical people aren't creative. They always need each other, and they're always on opposite sides of the room." That's why nothing gets done. That's why my bed is stacked high with technical manuals. It puts me to sleep just reading them, but you have to trudge through them. You have to learn new things, and you have to start all over, but art challenges technology, and technology challenges art. Always. So by doing this, I found that lead anvil, the film, was dropped off, and we could just move so much quicker. [HD] looks better, it's cheaper, and the creative process is altered so dramatically. Nobody knows that yet, because no one's shot on it. All these people who are saying, "Oh, it's no good, it's not there yet, the pixels aren't quite the same," they haven't shot with it. They have no idea what they're talking about. They're talking about the silliest things that are no argument if you just do a simple test. I was shooting on Spy Kids, and I had a film camera, and I brought the HD camera, and side by side, printed them both out to film—this isn't even HD projected digitally, which is far superior; this is HD transferred to film—so I could see where HD fell apart, where it still needed to be fixed, where it was like video. Instead, I was shocked to see how bad the film was. People's faces cratered in with contrast, and extra stuff that I was noticing anyway over the years, getting worse and worse. And I was like, "Oh my god, that's like Super-8! That's film?" And I would show it at film festivals. It would be like an audience of 300 people, and I would say, "In the next couple minutes, everyone here's gonna be convinced: Film is dead, and HD is the future of film." I'd show these tests and hear the gasps. They couldn't believe it. I've abandoned film forever. You can't go back. It's like trying to go back to vinyl after you've got recordable DVD. It makes no sense. And the industry is just so slow. And digital projection needs to come up. Consumers are always ahead of the industry. They're already into DVD, because they can see the difference between DVD and VHS. That's why they're buying DVDs. That's why they're buying digital still cameras. Because you can see that you got a picture. Instead of sitting there and blowing through rolls of film and then not getting the shot, you know immediately if you got it, and you move on. And that's what HD filmmaking does on the set: You finally see what you're doing. When you're shooting on film, you're shooting in the dark, you don't know if you even hit the canvas until the next day of dailies, when it's too late to recreate a performance or recreate a scene. And that's why a filmmaker will say, "Oh, yeah, that movie represents 40 to 60 percent of my vision." He was shooting blind. You're working in a visual medium, and you can't see what you're doing. It makes no sense at all. O: Your book Rebel Without A Crew includes a short piece called "The Ten-Minute Film School," which had a pretty clear course of action for people to follow. Has anyone ever come to you and said, "I did that"? RR: Oh, all the time. I'm always surprised when people come up to me and say, "Can you sign my book?" "Do you carry that thing around in your trunk?" And they go, "Yeah!" [Laughs.] It's, like, weird. This is the Bible! That's why I wrote it, because as soon as I saw that it was possible, I just wanted to tell people. I knew there were other creative people out there who just think, "I don't live in Hollywood, I don't have any contacts, I feel like I should be telling stories, but I was born in the wrong place at the wrong time." It's an advantage to be from somewhere else. I didn't realize it when it happened; when it happened accidentally, I was able to analyze it and go, "Oh my god, that's the way to do it." O: You've built up kind of a stock company over the last five films or so. Are there any advantages to working with the same actors over and over again? RR: Yeah, I really like working with the same people. Because I work in such a strange style. If you visited a real movie set, and one of my movie sets, it's two different things completely. And also, the actors I've worked with, they're so talented. Someone like Antonio, to just do an action movie with him, you're not taking full advantage of his talent. He's much funnier than you would ever think; he's got very good timing, he's a great singer. All these multi-talents, you want to use them in different things. To just use Steve Buscemi in Desperado, that's it? That'd rob him and me of having him for Spy Kids 2. RR: He always does in person; I've always known him to be that way. So I wanted to put that in a movie. I'd love to do a movie with Arnold Schwarzenegger, because if you know Arnold, he's not that guy he is in the movies; he's acerbic, really biting. You saw him for real in Pumping Iron; that's who he's really like. It's such a cool character because it's really him! I almost wanted to do Planet of the Apes, when they offered it to me with Arnold. I remember Charlton Heston was just cutting everything down in the first Planet of the Apes, just laughing at the guy for planting the flag. Arnold would do that great. And it would shock people if they saw what he was really like, and they would love it. O: There are other people like you—Steven Soderbergh, for instance—who seem to have more credits with each movie. Do you think other people are just holding back? RR: Oh, yeah. I don't even know about the current generation, but all the new generation coming up, there's gonna be multi-hatted moviemakers, because they're gonna start the way that I did, which was on video, where you're the whole crew. I mean, I made Mariachi that way because I was just used to making it that way. Crew for what? To watch me work? You can get out of control really quickly by divvying up all the jobs. O: Have you ever bitten off more than you can chew? RR: Never. Ten years later, with a much bigger thing at stake, it's actually easier. The process becomes simplified. You're thinking about the character, you're already imagining how you're gonna light it, how you're going to build the set to accommodate the lighting, to get across the feeling. You're able to do what [stop-motion animation pioneer and Spy Kids 2 inspiration] Ray Harryhausen did—you're able to give everything character. That's why instead of hiring an army of people to design gadgets for me, and picking the best ones, I made myself come up with the gadgets. Because I knew that would give it character. That's just so important. Yeah, it means I have to do more work, but I already wrote the characters and I wrote the dialogue—and I'm not the great writer; I could hire a much better screenwriter to come in and, yeah, you'd get some snappy lines, but it wouldn't have the character. And so when you come up with a gadget, even down to that minute detail, like a watch that does everything but tell time, that's very much in character with the rest of the movie, because I came up with that. Just like I came up with the character that says the line, just like I came up with the music, the eight notes that go with that character. It gives everything that character. That's why you do all those things. I was inspired a lot by Ray, because I saw that, yeah, he could have had an army of people behind him doing it, but would it have been as good, or as special, or as character-driven? When you see the hand of an artist, that's always great, but when you feel the soul of an artist, that's hard to touch and it's hard to do.